Holy Cross Oxford is a community welcoming all people of all ages to Follow Jesus, Learn and Grow. Everyone’s invited to follow Jesus: young and old, married and single, rich and poor, every nation and race. You don’t have to have it all together, in fact, you probably won't. That's why Jesus came for you. The first thing Jesus does with those he invites to follow him is teach them. Are you listening to what Jesus is teaching you? We learn what life is like by listening to Jesus, and we're learning as we go. When we follow Jesus and learn from Him, we grow in faith in Him and in love for one another. He doesn't require our perfection, but He invites our participation in the work He's doing in the world around us. Holy Cross Christian Preschool is now enrolling for our 2019-2020 school year! Jesus is at the center of everything we do. Our curriculum is designed to mesh appropriate materials and equipment with the delopmental needs of children as they gain mastery over the important foundation skills that are the forerunner to reading, writing, and arithmetic. We live out our mission by exploring our faith, experiencing God's grace, and expressing our faith in love. Everyone is invited to follow Jesus, and sometimes the best way to begin exploring your faith is by asking questions. There are several ways we explore our faith together. You can learn about here. At the beginning of worship at Holy Cross, we share these words: Let us follow Jesus, learn and grow as we come into His presence. We come to experience God’s love and mercy and to receive the gift of grace that only He can give. We experience God's grace together. Jesus says those who have been forgiven much love much. We seek to share God's love in our families, our church, and in our community. We love because He first loved us. We express our faith in love by serving our community and our church. Listen to our latest messages. The Miracles of Lent show us we need godly intervention. One things teaches this need more than anything else: death. We instinctually recoil from death. Even when we wouldn’t, God does whatever it takes to save us from death, even sacrificing His only Son, Jesus. Our Good Friday message. Jesus’ final act before he was arrested and crucified was to give us Himself for our forgiveness. He gives us His body and blood in the bread and the wine, shared with his disciples that night, and with every faithful person who follows Him. Our Maundy Thursday message. A wanted man, Jesus rides into the city and the people proclaim Him a king! Hosanna! Blessed is He who comes in the name of the Lord, even the King of Israel! We’ve studied the Miracles of Lent and how they show us our need for Godly intervention. Jesus rides into the city, ready to deliver. Are you listening to God’s Messengers? He sends many, then sends his Son. There’s a ton in here that’s amazing and we want you to read the Bible, so we’re leaving a breadcrumb trail to four prophets, Elijah, Elisha, Hosea and Amos. God’s Messengers always point us to Him. “The Story” sermon series continues. You can always text your questions to 248-274-4676. We’ll answer them in our Facebook Live at 2pm on Sundays. When Jesus Christ was crucified, the rocks were split in two. Cracking, popping, screaming, Creation itself was groaning to be restored. Jesus’ death and resurrection is Good News for us and for all of Creation. We continue our Miracles of Lent mid-week sermon series. When the kingdom is torn in two, we see the consequences of Solomon’s faithlessness in future generations. Things go from bad to worse. There’s division everywhere. What was true then, is true for us today too. We’re divided. What’s to be done? “The Story” sermon series continues. You can always text your questions to 248-274-4676. We’ll answer them in our Facebook Live at 2pm on Sundays. Death comes for everyone and everything. We need a resurrection. The miraculous raising of the dead started the day Jesus was crucified. The miraculous raising of the dead continues with every life saved by faith. We study this in our Miracles of Lent mid-week sermon series. Solomon was the king who had it all. But his problem is our problem: Solomon focuses on the gifts instead of the Giver. “The Story” sermon series continues. You can always text your questions to 248-274-4676. We’ll answer them in our Facebook Live at 2pm on Sundays. Have you ever experienced an earthquake? It gets your attention. The world shakes around you and creates fear and anxiety. There was a great earthquake the day Jesus was crucified. Jesus dies and the world literally quakes. We study this in our Miracles of Lent mid-week sermon series. King David’s greatest battles were fought against the Sin inside of himself. Instead of doing what he was supposed to do as a king by going off to war, he stays home and fails repeatedly. “The Story” sermon series continues. You can always text your questions to 248-274-4676. We’ll answer them in our Facebook Live at 2pm on Sundays. Sign up with your email address to receive our weekly announcements and prayer requests. It seems like we have April snow amnesia every year in Michigan. I don’t know how long you have lived in Michigan but it has snowed every year in April in the metro Detroit area at some point since I can remember for my 50-plus years. I may not like it, but I have come to expect it. What did you expect? 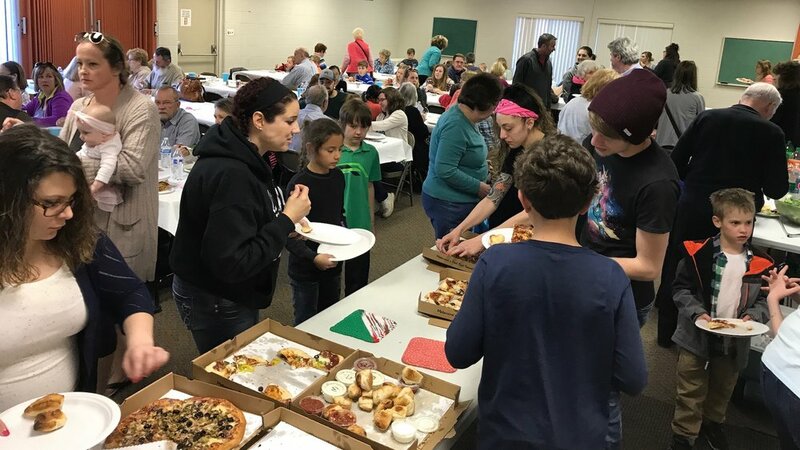 In early February, leaders from Holy Cross and Living Word got together to discuss what could be a new future for the Lutheran churches in North Oakland County, a way of working together for the proclamation of the good news of Jesus. Most all of us have heroes in life. We have people whom we respect and love, who have taught, led, guided and directed us in one or many areas of our lives. These men and women are a gift to us, some are around for a season and some for a lifetime, but regardless of how long they invest in us God uses them to shape us. I am thinking of just one in particular. Is it possible that many times people only know what we are against as Christians instead of what we are for? And if that is true, what are we for? Are we for the same things Jesus was for? Really. Are we? We know that what it means when we see a sign that says: Speed Limit 45mph. The law is to not go over the limit. We see it and we acknowledge that it is true. What do we do after that? We may understand and acknowledge it but do we do what it says? If you are anything like me, not nearly as often as I should. God shapes us in faith through what he gives and what he takes. As I was jogging the day after Christmas before work I pondered what to say when people would ask how was your Christmas? My desire was that my response be brief and honest. I decided I would respond by saying I had a 3D Christmas, which I did. To which everyone asked, 3D, what does that mean? When the waves of grief come in your life I encourage you to take 5, and ride them, if they pass by they are gone and the experience they afford you is gone. In Christ, we can be the best at grieving through all of its mysteries as well as a witness of what it means to have hope beyond death because of what Jesus has accomplished! “Jesus calls every church and every church leader for a purpose, and He equips us with everything we need to accomplish that purpose. You and your church don’t need one more member, one more dollar, or one more square foot of facility. You don’t even need a facility, if your church doesn’t have one.” What we need instead is a boldness to do what God calls us to do. To paraphrase the apostle Paul, God doesn’t call the equipped, he equips the called. May we, as Christians, respond to His call, remembering that every church, small and large, is part of His Church.